HDAC (Histone deacetylases) are a class of enzymes that remove acetyl groups (O=C-CH3) from an ε-N-acetyl lysine amino acid on ahistone, allowing the histones to wrap the DNA more tightly. This is important because DNA is wrapped around histones, and DNA expression is regulated by acetylation and de-acetylation. Its action is opposite to that of histone acetyltransferase. HDAC proteins are now also called lysine deacetylases (KDAC), to describe their function rather than their target, which also includes non-histone proteins. Together with the acetylpolyamine amidohydrolases and the acetoin utilization proteins, the histone deacetylases form an ancient protein superfamily known as the histone deacetylase superfamily. Vorinostat is a potent and orally available inhibitor of HDAC1, HDAC2 and HDAC3 (Class I), HDAC7 (Class II) and HDAC11 (Class IV ), with ID50 values of 10 nM and 20 nM for HDAC1 and HDAC3, respectively. Panobinostat is a non-selective histone deacetylase (HDAC) inhibitor. Entinostat is an oral and selective class I HDAC inhibitor, with IC50s of 243 nM, 453 nM, and 248 nM for HDAC1, HDAC2, and HDAC3, respectively. Romidepsin is a potent HDAC1 and HDAC2 inhibitor with IC50s of 36 and 47 nM, respectively. Remetinostat (SHP-141) is a hydroxamic acid-based inhibitor of histone deacetylase enzymes (HDAC) which is under development for the treatment of cutaneous T-cell lymphoma. Valproic acid is an HDAC inhibitor, with IC50 in the range of 0.5 and 2 mM, also inhibits HDAC1 (IC50, 400 μM), and induces proteasomal degradation of HDAC2; Valproic acid sodium salt is used in the treatment of epilepsy, bipolar disorder and prevention of migraine headaches. Ricolinostat (ACY-1215) is a potent and selective HDAC6 inhibitor, with an IC50 of 5 nM. ACY-1215 also inhibits HDAC1, HDAC2, and HDAC3 with IC50s of 58, 48, and 51 nM, respectively. Butyric acid is a histone deacetylase (HDAC) inhibitor, with anti-tumor effects in several cancers. Mocetinostat (MGCD0103) is a potent, orally active and isotype-selective HDAC (Class I/IV) inhibitor with IC50s of 0.15, 0.29, 1.66 and 0.59 μM for HDAC1, HDAC2, HDAC3 and HDAC11, respectively. Mocetinostat shows no inhibition on HDAC4, HDAC5, HDAC6, HDAC7, or HDAC8. Sulforaphane is an isothiocyanate present naturally in widely consumed vegetables; has shown anticancer and cardioprotective activities. RGFP966 is a highly selective HDAC3 inhibitor with an IC50 of 80 nM and shows no inhibition to other HDACs at concentrations up to 15 μM. Tubacin is a potent and selective inhibitor of HDAC6, with an IC50 value of 4 nM and approximately 350-fold selectivity over HDAC1. Belinostat is a potent HDAC inhibitor with an IC50 of 27 nM in HeLa cell extracts. Quisinostat (JNJ-26481585) is an orally available, potent HDAC inhibitor with an IC50 of 0.11 nM for HDAC1. Valproic acid sodium salt is an anticonvulsants used to treat epilepsy, bipolar disorder and migraines. Valproic acid inhibits histone deacetylase 1 (HDAC1) with an IC50 of 0.4 mM. Sodium phenylbutyrate is an inhibitor of HDAC and endoplasmic reticulum (ER) stress, used in cancer and infection research. TCR, GPCR and HDAC II interaction: Diverse agonists act through G-protein-coupled receptors (GPCRs) to activate the PKC-PKD axis, CaMK, Rho, or MHC binding to antigens stimulates TCR to activate PKD, leading to phosphorylation of class II HDACs. Phospho-HDACs dissociate from MEF2, bind 14-3-3, and are exported to the cytoplasm through a CRM1-dependent mechanism. CRM1 is inhibited by leptomycin B (LMB). Release of MEF2 from class II HDACs allows p300 to dock on MEF2 and stimulate gene expression. Dephosphorylation of class II HDACs in the cytoplasm enables reentry into the nucleus. TLR: TLR signaling is initiated by ligand binding to receptors. The recruitment of TLR domain-containing adaptor protein MyD88 is repressed by HDAC6, whereas NF-κB and MTA-1 can be negatively regulated by HDAC1/2/3 and HDAC2, respectively. Acetylation by HATs enhance MKP-1 which inhibits p38-mediated inflammatory responses, while HDAC1/2/3 inhibits MKP-1 activity. HDAC1 and HDAC8 repress, whereas HDAC6 promotes, IRF function in response to viral challenge. HDAC11 inhibits IL-10 expression and HDAC1 and HDAC2 represses IFNγ-dependent activation of the CIITA transcription factor, thus affecting antigen presentation. IRNAR: IFN-α/β induce activation of the type I IFN receptor and then bring the receptor-associated JAKs into proximity. JAK adds phosphates to the receptor. STATs bind to the phosphates and then phosphorylated by JAKs to form a dimer, leading to nuclear translocation and gene expression. HDACs positively regulate STATs and PZLF to promote antiviral responses and IFN-induced gene expression. Cell cycle: In G1 phase, HDAC, Retinoblastoma protein (RB), E2F and polypeptide (DP) form a repressor complex. HDAC acts on surrounding chromatin, causing it to adopt a closed chromatin conformation, and transcription is repressed. Prior to the G1-S transition, phosphorylation of RB by CDKs dissociates the repressor complex. Transcription factors (TFs) gain access to their binding sites and, together with the now unmasked E2F activation domain. E2F is then free to activate transcription by contacting basal factors or by contacting histone acetyltransferases, such as CBP, that can alter chromatin structure. The function of non-histone proteins is also regulated by HATs/HDACs. p53: HDAC1 impairs the function of p53. p53 is acetylated under conditions of stress or HDAC inhibition by its cofactor CREB binding protein (CBP) and the transcription of genes involved in differentiation is activated. HSP90: HSP90 is a chaperone that complexes with other chaperones, such as p23, to maintain correct conformational folding of its client proteins. HDAC6 deacetylates HSP90. Inhibition of HDAC6 would result in hyperacetylated HSP90, which would be unable to interact with its co-chaperones and properly lead to misfolded client proteins being targeted for degradation via the ubiquitin-proteasome system.
. Vega RB, et al. Protein kinases C and D mediate agonist-dependent cardiac hypertrophy through nuclear export of histone deacetylase 5.Mol Cell Biol. 2004 Oct;24(19):8374-85.
. Shakespear MR, et al. Histone deacetylases as regulators of inflammation and immunity. Trends Immunol. 2011 Jul;32(7):335-43.
. Suliman BA, et al. 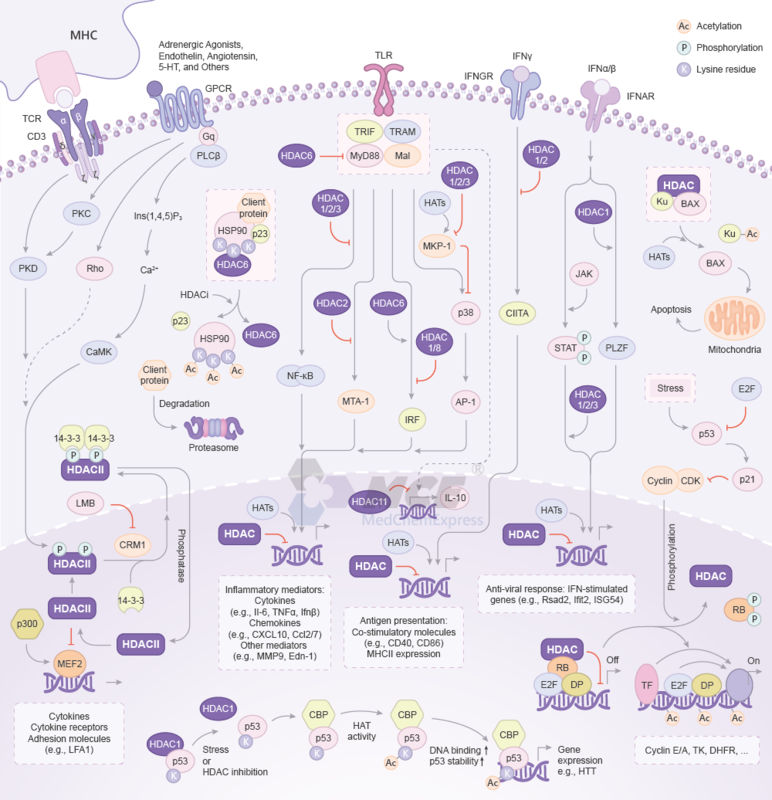 HDACi: molecular mechanisms and therapeutic implications in the innate immune system.Immunol Cell Biol. 2012 Jan;90(1):23-32.
. Brehm A, et al. Retinoblastoma protein meets chromatin.Trends Biochem Sci. 1999 Apr;24(4):142-5.
. Minucci S, et al. Histone deacetylase inhibitors and the promise of epigenetic (and more) treatments for cancer.Nat Rev Cancer. 2006 Jan;6(1):38-51.